But aside from the Wickershams indeed being murdered, most of the important facts in the article were wrong. Robbery probably was the motive; no evidence implicated the Chinese cook, who immediately became the prime suspect only because his whereabouts were unknown and other (more likely) culprits weren't considered. The Wickersham killings had an immediate impact on Sonoma county and the state, leading to boycotts of Chinese businesses and expulsion of immigrants from towns - and its ripples even reached Congress as more anti-Chinese legislation passed in the following years. But despite its importance. actual details of the Wickersham case never have been closely examined. This is a tricky tale to write because every newspaper added, omitted and/or contradicted details found in other papers. Often the differences were minor - but sometimes they were critical to interpreting events. In almost every case I selected a version that came from an interview with someone with first-hand knowledge, but some players were so eager to implicate the Chinese man that they apparently lied or exaggerated, and in one case, possibly tampered with the crime scene. Any non-trivial differences are discussed. If you want the complete scoop, newspaper transcriptions for the whole series will be available for download in a separate text file. As we begin, keep in mind this is an important moment in our history only because of a perfectly awful set of circumstances. Had the Wickershams been murdered six months earlier or later the tragedy might have been little noticed - but it happened at the peak of local anti-Chinese frenzy. Had the Wickersham ranch not been so hard for authorities to reach, accurate details might have been reported quickly - instead, newspapers fed the public's hunger for news by printing lies and rumors. And even Mother Nature seemed to conspire to make any possible investigation difficult - there was a Perfect Storm before the crime was discovered which likely obliterated evidence. The winter of 1885-1886 was fairly mild and dry in Sonoma county - except for the third week of January, when the North Bay was slammed with torrential rains and high winds. There was snow on St. Helena and Sonoma Mountains; major roads were impassible, with the with the well-traveled route through the Sonoma Valley compared to a lake. It was fourteen miles to the Skaggs' Hot Springs resort, where hopefully the telephone and telegraph lines were still up despite the overnight storm winds. Jewell knew the winding road well and in good weather he probably could get there in under three hours. That day it apparently took him twice that long. The weather had made the route treacherous; the next morning the county coroner's horse would slip and fall along this road enroute to the crime scene. Jewell was more of a gentleman farmer and the place he called "Castle Rock Ranch" was the couple's country home. At the time Jewell was 35 and owned the Petaluma News Depot, one of the most important businesses in south county because it handled all newspaper, magazine and book sales. Although his parents were rich he seemingly did well on his own, later owning a hop ranch near Fulton and trying his luck at gold mining in the Yukon. The couple mainly lived in Petaluma before moving on to Santa Cruz and San Francisco. Jesse C. Wickersham had a very different lifestory. His uncle was Isaac G. Wickersham, the wealthiest man in Sonoma county and president of the National Gold Bank of Petaluma - one of nine banks in the state allowed to actually print money. Jesse was 52 and had lived in his uncle's shadow for years, working as an assistant cashier and notary at the bank, then as an insurance agent for another of his uncle's companies. He also married the sister of his uncle's wife, a widow who was his same age. He was also dependent upon his in-laws; he and wife Sarah lived with them in Petaluma, and his father-in-law was co-owner of the ranch. Or maybe the problem was psychological. Unlike the Jewells who came and went between their ranch and Petaluma, Jesse and his wife apparently remained there all the time. 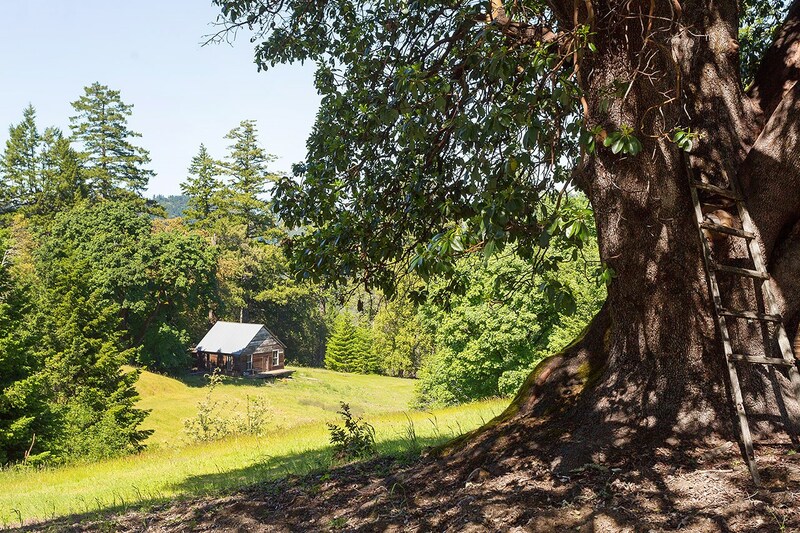 That they chose to live a reclusive life at one of the most remote places in Sonoma county is worth noting along with his earlier "failure to launch" - never advancing beyond menial clerical jobs, despite the remarkable advantage of his family connections. Another important detail in his bio: Jesse was a Civil War vet who served almost the entire duration of the war, advancing to First Lieutenant (not Captain, as claimed in some of the contemporary articles). He was in the 2nd Iowa Infantry - where nearly half the regiment was wounded or killed - and fought in some of the worst battles, including Vicksburg, Shiloh and Atlanta; perhaps he had shrapnel that later dangerously shifted in his body, or maybe he had severe PTSD. The Jewells reached Skaggs' Springs in late afternoon and fortunately, both telephone and telegraph lines were functioning - no sure thing in rural Sonoma county even 25 years later, as outlying customers provided the wires to connect to the nearest company office, which in this case was Geyserville. Jewell either spoke or telegraphed the coroner, sheriff and I. G. Wickersham. Some of the misinformation that spread over the following days was probably due to the lo-fi quality of the telephone connection - the wood cutters were first identified as Italians and not Indians, for example. And soon after that all lines to Skaggs' Springs went down, blocking reporters from asking questions or receiving any updates for two long days. Although there was little more than an hour before the last "up-train" departed from Petaluma, the county coroner and marshal were onboard headed north, along with Fred Wickersham, the adult cousin of Jesse. They were joined by others in towns along the way; the party that finally arrived at the Wickersham ranch included at least 17 men and likely more. Scene of the Jesse Wickersham murder. 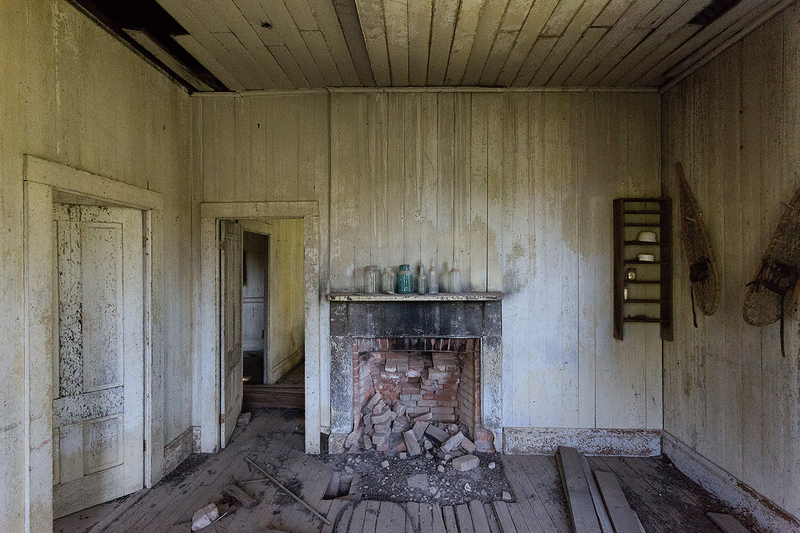 The door to the left of the fireplace led to the kitchen, and the door on the left wall led to a bedroom, where presumably Sarah's body was found. A back bedroom can be partially seen through the open kitchen door. When the group entered the cabin they found Truitt examining Jesse's body, which was in a chair with its back to the fireplace. He had been shot in the back of the head as the couple was sharing a meal. Jesse had another shotgun wound on his right side. The coroner did not say which shot he believed was first, but believed either of them would have been fatal. The significance of this shot is discussed in part two. Sarah was found in their bedroom. Her wrists were tied behind her back with the same clothesline rope looped around her chest, the end tied to the bed (I'm guessing the rails of a brass bed). She was half-kneeling beside it with her head resting on the bed. She had one shotgun wound to her right side. The bed was neatly made and unruffled. The coroner made no mention of sexual assault, but he also did not describe the condition of her face, which several newspapers described as being "mutilated." One account claimed her nose was broken and the reliable Petaluma Courier reporter wrote her "face was swollen and bruised." There is indeed a religious belief that the spirit of someone who has died violently can become a "hungry ghost," but it's hardly a secret that Chinese generally made food offerings to the dead. The meticulous Courier reporter does not mention anything about a piece of cake on the bed; the newspapers that did so were quoting or paraphrasing Marshal Blume or Constable Truitt, who also kept pushing the "outraged" claim even after the Wickersham family asked everyone to knock it off. In short, I don't think there's much question that this part of the story was planted in order to prove the Chinese cook had to be the killer. The cook's room was also inspected, and will be discussed in part two; all that's crucial to know is that nothing incriminating was found there except for some clothesline like the rope used to tie up Sarah. Elsewhere in the house someone found Jesse's meticulously-kept journal with the last entry made after Sunday night supper. That and a burned-dry lamp on the table led them to conclude the murders happened between 5-6PM on Monday, four days earlier. But at least some times of the year, Jesse kept large amounts of cash around to pay ranch hands. Again the Petaluma Courier seemed to have the last word: "A small satchel, however, in which the rancher was known to sometimes keep money, was found open... No one present was able to state whether there was much or little money in the house before the deed was committed." The Courier also had an anecdote about Jesse unexpectedly settling a $100 debt with a neighbor - the equivalent of over $3,300 today. Another time he had to defer paying the neighbor because "He had nothing less than a twenty." While the Healdsburg doctor did the autopsies, Marshal Blume took a party of the men to search the range for any signs of the cook. Finding nothing, the coroner's jury heard evidence from the doctor and Elliott Jewell, coming to the conclusion that the Wickershams "came to their death from gunshot wounds, inflicted by unknown hands, ail evidence pointing towards a Chinese cook in the employ of deceased." 6 Some accounts state he rode immediately to Skaggs' Springs, but I found it doubtful that he would leave his wife alone, given that the murderer could still be in the area. Two people traveling in a buggy would also be slower and help explain why the trip took around six hours. Hours before dawn, the boys were gathering at the depot waiting for the circus train. They would be playing hooky that day but wouldn't get into much trouble for it; after all, their fathers did the same thing (and maybe grandfathers, too) and they had heard their elders speak wistfully about the pleasure of it, waiting in the dark with a swarm of kids and grown men for the trainload of marvels speeding their way on the rails. 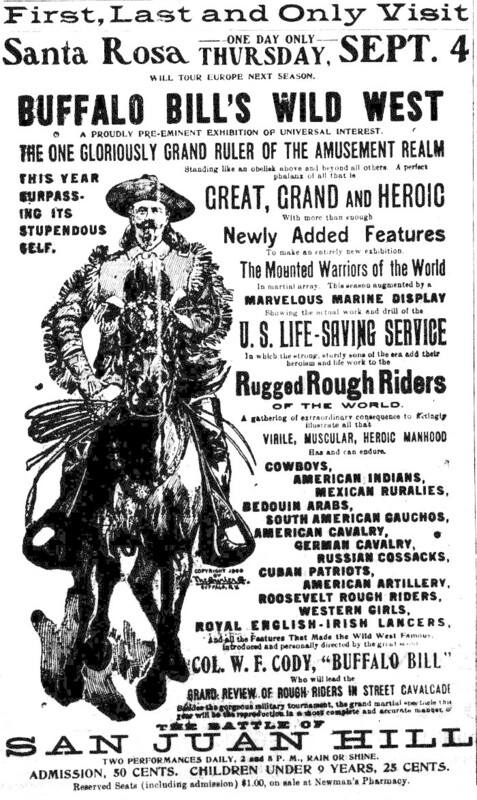 From the 1916 Argus-Courier: "A monster train of red cars, loaded to the guards with circus paraphernalia and equipment of the John Robinson ten big combined shows, the oldest circus in the world, reached Petaluma Thursday morning, a little late but all safe and sound. There was a good sized reception committee on hand to welcome the showmen. Some were there who declared they had not missed seeing a circus 'come in' in twenty years. A few even remembered the last time the John Robinson circus visited California 35 years ago. Some small boys were at the depot as early as 3 a. m. although the circus did not arrive until 8:30." Setup in Santa Rosa was easier than many towns, where the fairgrounds were usually outside city limits and far from the depot. Here the show lot was nearly in the center of town - the former grounds of the old Pacific Methodist College (now the location of Santa Rosa Middle School, between E street and Brookwood Ave). Once the college buildings were removed around 1892, the nine acre vacant lot became the temporary home of every show rolling through. A big attraction for the 1883 John Robinson's Circus was the electric light "as bright as the noon-day sun." For advance PR they sent newspapers a humor column about "Uncle Jerry Peckum" complaining the "sarkis" tent being too close to his chicken farm: "It's lit up so brite thet every last one o' them tarnal fool chickins thinks it's daylite again', an' got up an' gone to layin.'" The column ended with Jerry deciding to go to the circus because "I've heern so much about this 'lectricity light--an' we may never hev a chance to see one agin." The promo piece ran in the Petaluma Argus, naturally, because chicken. Speaking of ripoffs: Earlier the Santa Rosa Daily Democrat ran an amusing reprint from a New York paper describing the predator/prey relationship between a circus "candy butcher" (food vendor) and the locals: "...The candy butchers in a circus never work the bottom row of seats. Country bumpkins who easily become their prey always get up on the top benches. They do this because they are afraid of the 'butchers' and want to hide from them. The latter move around on the top seats, and when they find a verdant fellow they fill his girl's lap with oranges, candy, popcorn and fans. If the girl says she doesn’t want them they ask her why she took them, and make the young man pay thirteen or fourteen prices for the rubbish..." The piece continued by describing the pink in a circus' trademark pink lemonade was a red dye added to conceal how little lemon actually was in the drink: "Strawberry lemonade men make two barrels of the delicious beverage which they sell of ten cents worth of tartaric acid and five cents worth of aniline and two lemons. They make fifty dollars a day each..."
I'm sure it lived up to its claim of being the "greatest show on earth," but when the Ringling Brothers Circus made four visits during the 1900s we were flooded each time with the greatest hype on earth, as the Press Democrat seemingly printed every scrap of PR flackery the advance promoters churned out as "news" articles. "The aerial features of Ringling Brothers shows by far surpass anything of a similar nature ever exhibited in the United States. The civilized countries of the world have been thoroughly searched for the newest and most thrilling acts." (1903) "Their Acts in Ringling Brothers’ Circus Almost Surpasses the Possible." 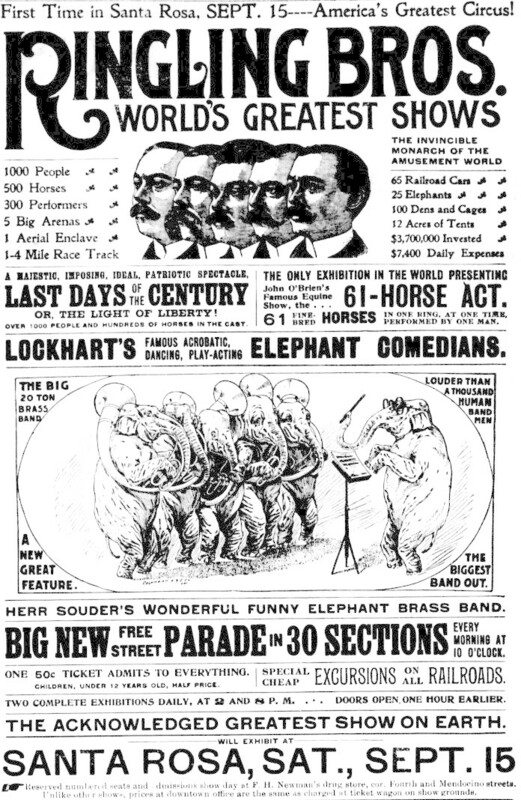 (1904) The low point was probably the 1907 article, "Interesting Facts Regarding the Expense of Advertising and Maintaining a Great Circus," which was neither very interesting nor very factual: "An elephant without plenty of feed is as dangerous as a healthy stick of dynamite." Yowp! Santa Rosa schools were dismissed at 11AM on the Thursday morning when Buffalo Bill's Wild West Show came to town, which was a pragmatic surrender of any hope for keeping the kids at their desks once the parade started marching down Fourth street. There was no Big Top for this show, just a horseshoe-shaped grandstand that could seat 16,000. The audience was apparently immense; the PD reported, "afternoon and evening the vast seating accommodations was occupied with a sea of humanity." These 1902 performances were not Buffalo Bill's "last and only" shows in Santa Rosa. He was back again in 1910 for his "farewell tour," and also in 1914, after he lost the legal use of the “Buffalo Bill” name and had to perform with the Sells-Floto Circus. For more, see "BUFFALO BILL STOPS BY TO SAY GOODBYE." "Early in the day farmers from far and near came driving to town with their entire families while special trains brought crowds from points as far away as Ukiah," reported the Press Democrat in 1904 about the third appearance here by the Ringling Brothers Circus. "By 11 o'clock the streets were thronged with a good natured perspiring crowd prepared to be amused at any thing." Unfortunately, Santa Rosa was suffering through a heat wave that September morning: "The Court House proved a very attractive place as it was so cool and refreshing within its walls while outside the thermometer ranged from 100 upward from 10 o’clock. Many of the windows were filled with the families and friends of the county officials, while the steps and shady portions of the grounds were packed with outside visitors. All along the line of march all available windows and other points of vantage were packed, while great throngs moved restlessly up and down the principal streets, and crowded the stores." The description of the circus parade was probably rewrite of PR copy, but it's still fun to imagine a sight like this coming down Fourth street: "Never before in the history of Santa Rosa has there been such a parade as Ringling Bros, gave Thursday. Floats and chariots, half a dozen bands, numerous companies of horseback riders representing various nationalities, both men and women, a drove of thirteen camels, twenty-six elephants and many open cages of wild animals. Altogether there were over 375 horses in the parade. They were ridden, driven two and three tandem, in teams of two,. four, six, eight and twenty-four horses each. One of the most pleasing sights to the younger people were the twenty-four horse team on the band wagon and the twenty-four Shetland pony team on a float." 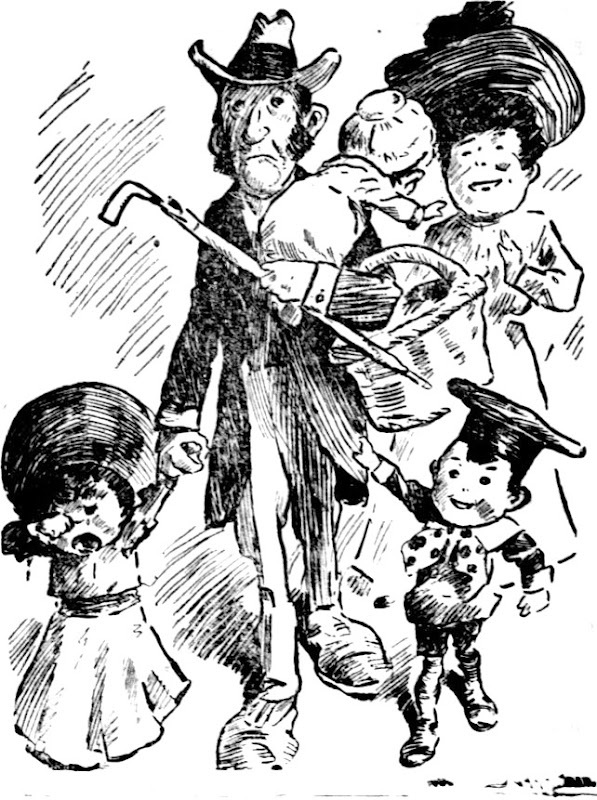 1905 Press Democrat cartoon: "In Town for the Circus"
Norris & Rowe's Circus was a Santa Rosa favorite in the first decade of the Twentieth Century, and not just because they reliably showed up every April. "On account of the fact that it is a California show," explained the Press Democrat in 1905, "the people of this state are naturally interested in its success from year to year, and the enterprise of Norris & Rowe in having advanced in a few years from a small dog and pony show to the growing circus that they now possess, has been highly commended." Alas, the show had no end of problems, well symbolized by the photo below showing their 1905 "Grand Gold Glittering Street Parade" in Santa Rosa taking place during a downpour. Their last appearance here in 1909 shocked some by offering "several gambling schemes" and a racy sideshow “for men only.” The circus went bankrupt and closed in 1910. For more see: "BROKE DOWN CIRCUS." The main performer was 20 year-old Yvone La Raque, who was seated in an "automobile" at the top of a narrow ramp near the top of the tent, about 65 feet in the air. (I can find no claim the little vehicle actually had an engine.) When her cart was released it dropped down the ramp and flew off with enough speed to somehow execute a somersault. She and the little car landed on a separate spring-cushioned ramp several feet away. The entire business took only 4-5 seconds. 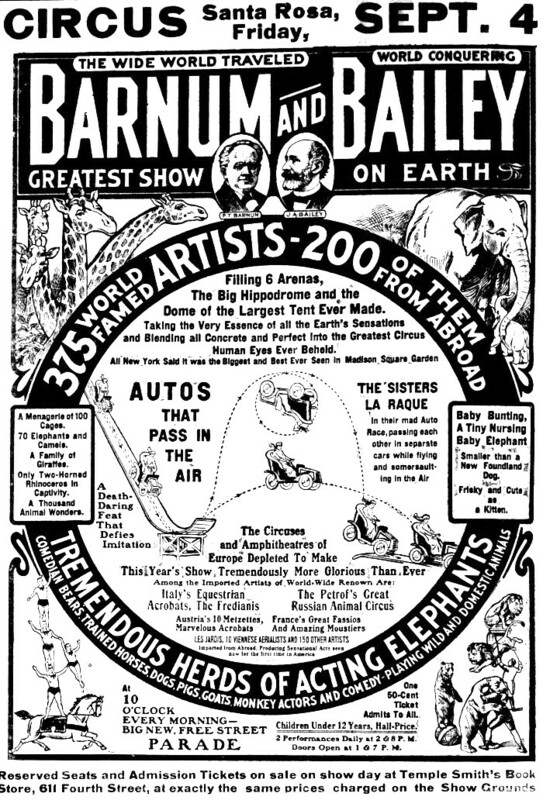 And finally we come to the Al G. Barnes Circus. The ad below is from 1921, but his show first appeared in Santa Rosa ten years earlier. I deeply regret having not found much about him beyond a few anecdotes - he clearly was gifted with a rare magnetic personality and both people and animals were drawn to him instinctively. His friend and attorney Wallace Ware tells the story of seeing Barnes throw meat to a fox in a forest, then approaching the wild animal and petting it as if it were tamed. He trained performing animals with food rewards but also by talking to them with genuine sincerity as if they could understand everything he said. Ware's memoir, "The Unforgettables," has a section on Al worth reading if you'd like to know more. 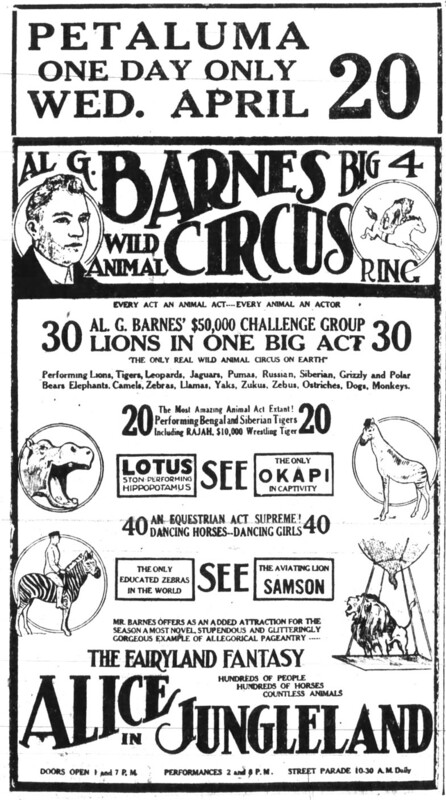 Barnes also had a private zoo near Los Angeles where he kept animals too old or too wild to be in the circus. It must have been enormously expensive to maintain - supposedly it numbered around 4,000 animals - but kudos to him for not destroying the unprofitable animals or selling them off to carnivals where they likely would suffer great abuses. 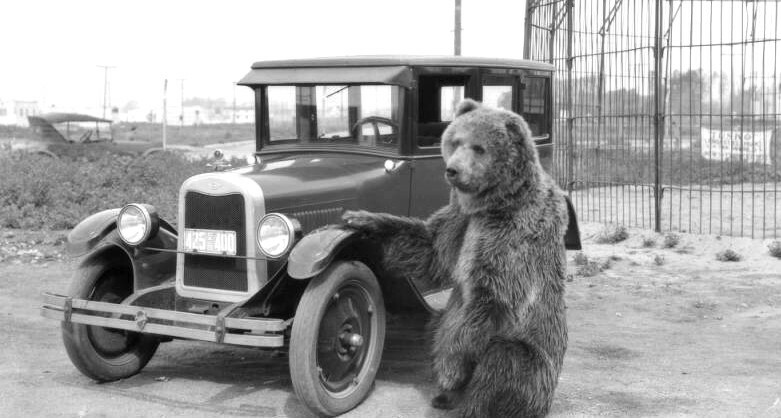 That was the 1920s, remember; there were no animal sanctuaries for former circus animals, tame or no, and trade newspapers like Billboard and the New York Clipper regularly had want ads of circus animals for sale. The Press Democrat treated him like a hometown boy although he was from Canada and lived in Southern California when he wasn't touring. The PD reprinted news items about his circus, his illnesses and reported his marriage on the front page. When he died in 1931 the PD wrote its own obit: "When Al G. Barnes rode into the ring, swept off his hat, bowed and welcomed the crowd, you knew who was running the show...his death will be generally regretted, not only in a personal way but because it marks the passing of a picturesque character, one well known in the west--one of the last of the kind." Before Thanksgiving or Independence Day were national holidays, there was only one event nearly every American celebrated, regardless of class, race or creed: The day the circus came to town. That two-century tradition ends on May 21 when Ringling Bros./Barnum & Bailey gives its last performance. Before the Big Top comes down for the last time, here's a look at what it meant to small towns like Santa Rosa and Petaluma, as viewed through their newspapers. By no means does this series represent all the circuses that came to Sonoma county - this is only a small sample. It was not uncommon to have two or three every year, and even the shows that returned often were different enough each time to be a considered new. Because of the number of images involved I'm breaking this article into two parts. This section covers the early circuses travelling by roads and waterways; these wagon shows were dinky affairs compared to some of the monster spectaculars which came here after the railroads were available, as discussed in part two, "LET’S GO TO THE CIRCUS ON COLLEGE AVE". But regardless of the year or degree of magnificence, every circus day was magic and the climax of weeks of hot anticipation. The places you had walked past thousands of times - fences with scabby whitewash, streetlight poles, the plain brick walls on the sides of businesses - those drab things were now transformed by beautiful lithograph posters showing flying trapeze women, daredevil animal trainers and other scenes you had never imagined. You know the scene in The Wizard of Oz where Dorothy opened the door to Oz into a world riot in color? It was like that, only better because YOU were about to enter such a magical place. And you would go there. Nothing on earth could stop you. This is the oldest circus ad I've found in the local newspapers, dating to June, 1856. The promise that "The Police Department will be under the supervision of efficient officers" suggests the public believed a circus attracted criminals and troublemakers. The 1857 ad for the Lee & Bennett circus also has the "efficient officers" vow. Note they don't say much about the acts, but boast at length of their "magnificent, new, and costly" wagons. They promise the Big Top is waterproof and ladies will get cushions for their seats. Classy! The patriotic theme of the "United States Circus" reflects the national mood in the first months of the Civil War - although it may not have gone over so well in pro-Confederacy Santa Rosa and Healdsburg. "Blondin" was the famed tightrope walker who crossed Niagara Falls. Although there was still no train service to Santa Rosa in 1869, we were on the tour route of Dan Castello's Circus and Menagerie, the first East Coast show to come to California via the new transcontinental railroad, which had been completed less that four months earlier. "Their immense posters cover half the town, and everybody is anxiously waiting to see the greatest show of the age," the Democrat commented. It seems the ads exaggerated the number and varieties of animals; their wagon caravan included only ten cages and a couple of elephants and camels. A correspondent to the Russian River Flag wrote, "It was agreed by us that the menagerie was a failure, but the circus part we liked very well." The 1872 San Francisco Circus and Roman Hippodrome was the first show in Santa Rosa to introduce exotic themes, with an "oriental pagoda" and Roman Empire-style chariot races. The show also included a political angle, with "Horace Greeley, Comic Mule." That year Greeley was the most well-known among the eight candidates running against incumbent President Ulysses S. Grant and lost by a landslide (in Santa Rosa he came in fourth). Greeley actually had died four days before this Santa Rosa performance. Montgomery Queen's 1874 Circus and Traveling World's Fair drew an audience of 2,800 that night in Santa Rosa - about the same as the official population of the town. Since before the Civil War, the price for an adult ticket was always one dollar, which would be between $30-40 in today's currency. Even if half this 1874 audience were children, they pulled in about $60,000 (adjusted for inflation) with this one show. While circus life was hard on the performers, crew and animals, it was undeniably very profitable for the owners. “Whar are they a-goin’ to stretch the canvass?" Courthouse Square is (finally) reunited, so we can (finally) say our downtown has sort-of a park, although there's so much parking on the sides it is much smaller than need be. But the important thing is Santa Rosa (finally) has a central place where citizens can gather together - something the town has sought since its founding in 1854. In the layout of the town 163 years ago it was called the Plaza, but I can't recall seeing much evidence it was used for public gatherings except for a portion of the ceremonies for the 1876 Centennial. It was simply a small lot criss-crossed by footpaths and usually in pretty rough shape because no one took care of it. Its potential as a park was further limited when it was clearcut in 1884 to build a courthouse and after that one tumbled down in the Great Earthquake of 1906, the parcel was almost completely filled with the elephantine courthouse built to replace it. But having a nice public park was a Very Big Deal for our ancestors, and not just for sports and recreation; a park was the heart of 19th century communities. Having a pretty park came with considerable bragging rights - it was the yin to promoting a town paired with the yang of boasting about the burg's economic prowess and promising future. So if you want to grasp the history of Santa Rosa understand this: The city fathers yearned to be a great Bay Area metropolis, and at the tippy-top of their wishlist was having a terrific park. At a minimum, Santa Rosa needed a place for political rallies, holiday celebrations, group picnics and the like. Except for the occasional circus or traveling theater group, these doings were about the only entertainment in a small town like this during the 19th century; if there was to be an Admission Day parade with marching band followed by a snoozefest speech about the Mexican War from Colonel I. Blather, Ret., you, sir or madam, would be in that audience along with hundreds of your neighbors - and glad for it. For about a dozen years around the 1870s, the destination was Arcadia Park, also known as "Willows." (Its site was obliterated by Highway 101 but the current intersection of Morgan and Ninth street was near the southeast corner, with the northwest end being the corner of Davis and Tenth street on the west side of the freeway.) It was privately owned and available for rental, and apparently not open every day. Sometimes admission was charged, but it's not clear if that went directly to the property owner or the group holding the event. Public use faded in the 1880s after it was bought by the Metzger family, who built a home on the property followed by a winery. But it also had other drawbacks which made it less than optimal. It was about a half-hour walk from downtown with no public transport (meaning horse-drawn trolley) and was apparently little more than a vacant lot with no amenities - although some newspaper descriptions mention a saloon, dance floor and a ten-pin bowling alley, these structures must have been quite small or temporary. The whole place was only an acre, not much larger than the original plaza. That it was so well-used only shows how desparate Santa Rosa was. On the east side of town was another private park over twice as big and with much more to offer. It was closer to downtown and on the trolley line, where Fourth st. meets McDonald and College avenues (today it's the Creekside Park apartment complex at 1130 4th street). "City Gardens" backed on to Santa Rosa Creek and had a tiny lake/pond, a zoo of some sort and a velocipede track where bike enthusiasts could race around "at a 2-40 gait" (about 22 MPH), according to an 1869 item. That place also had a special significance in Santa Rosa history, as it was around there where Julio Carrillo and his pals hosted a blowout Fourth of July picnic and ball in 1854 to convince county residents to vote for making Santa Rosa the county seat - although the town barely existed at the time. Spoiler alert: It worked. Never underestimate the power of free BBQ. The usual dress parade and guardmounting [sic] was had on Tuesday, and we noticed a marked increase in the crowd of citizens in attendance. After its close the sunset gun was fired, and supper discussed, and the non-commissioned officers and privates began to prepare for their enjoyment. The tents were placed in order with alacrity, and when the shades of evening begin to lower, the campfires were lit, the lanterns to shed their dubious light, and the camp took on its usual gala appearance. The splendid band took its position in the pavilion at the City Gardens, and soon the floor was filled with dancers. At the same time Arcadia Park was fast fading away as the Metzger winery expanded. About the only events advertised at the park now were picnics for the German Social Club (of which William Metzger was a leader) and the annual Italian picnic. And that was another reason park use dwindled: The area around it had grown into being the Italian community which was shunned by the racist, pro-Confederacy society which dominated Santa Rosa - and would continue to do so for decades. City Gardens closed for a year and reopened under a new owner: Peter Henry Kroncke (that spelling is correct, but he was variously tagged in the newspapers as "Kronke," "Kroncker," and the grunty, "Kronk"). Henry Kroncke was well-established in town as owner of the Santa Rosa Planing Mill and was often mentioned for his partnerships with others in the lumber and construction trades. There is no dispute that he built a beautiful park and it looked like Santa Rosa at last had found its heart - or at least, a nice place for anyone who could afford the 25¢ admission, the equivalent of about six bucks today. That second ad also stated this: "Grand excursion from San Francisco." From Kroncke's agent in the city anyone could buy a round-trip ticket to Santa Rosa at the subsidized price of $1.00 - not including the park admission price, of course. Enough daytripping San Franciscans to pack fourteen train cars came to watch the sword fight, and those attendance numbers continued all summer, with apparently 1,000-1,5000 coming to Santa Rosa each Sunday. Kroncke's Park was clearly a smashing success for both itself and the town. There was one eensy little drawback: The big crowds attracted pickpockets. "That exception to the pleasures of the day is one that is attendant on all such occasions," wrote the Sonoma Democrat. Uh, since these "occasions" were scheduled for every weekend, did that mean Santa Rosa should brace for a regular influx of wrong-doers? Why...yes. Both Santa Rosa newspapers downplayed the problems at first. A month later the Petaluma Courier wrote their town would never welcome Sunday excursion visitors because of the "hoodlums and roughs" who were showing up in Santa Rosa. "While it is a fact that two or three pickpockets plied their trade successfully in the crowd that attended the sword contest here," the Sonoma Democrat replied, "otherwise these excursions to this place have been very orderly and almost entirely free from the hoodlum element, considering the number of people present." As the summer wore on, the papers could no longer gloss over the mounting problems. In August, excursionists vandalized two commercial orchards, seriously damaging and even destroying trees. Then a few weeks later, a Democrat article began with this: "The excursion to this city and Kroncke’s Park Sunday, was made up chiefly of hoodlums..."
While still being an apologist and stating "it should not be inferred that all the excursions have been objectionable," the paper reported police had to break up a free-for-all fight at the park and brawls continued throughout the afternoon. An officer clubbed a disorderly man unconscious on Fourth street. Worst of all, "when the train left for San Francisco in the evening about sixty ot the hoodlums got left, and put in the night parading the streets." I'm sure that must have been a peaceful evening in old Santa Rosa. The worst incident came the following year, as an excursion coincided with the last day of the county fair. The "sallow-faced individuals dressed in chinchilla coats" and "their vulgar female companions [were] an outrage on all sense of decency" as they bullied their way around downtown, pushing people off the sidewalks and stealing booze and cigars from saloons. One of the crowd entered a hotel and grabbed the heavy bell used to announce dinner service and hit the hotel owner in the head with it, knocking him cold. A Deputy Sheriff and two off-duty San Francisco policemen arrested the man on the returning train, but only after a confrontation with the guy's pals who were trying to hide him from the cops. Yet the newspapers - particularly the Republican - continued holding Kroncke's Park and its excursion train promotion blameless. In a February 1888 puff-piece, the Republican paper gushed, "We have begun to look upon Kroncke's Park as an almost necessity; in fact it would be difficult to tell what we would do without it". Finally, in 1890 and after some 700-800 signed a petition demanding the City Council take action (the town population at the time was around 5,000), Kroncke's liquor license was denied. The end of booze apparently meant the end of the excursions, and likewise the end of the troublemakers. The park didn't close, but it's not clear whether it was still open every day. Like the old Arcadia Park, it's mentioned in the papers as being used for political rallies and rented for group picnics. Even sans alcohol it was a special place. As seen on the fire map below, there was an enclosed bowling alley (they played ten pin, same as today, except with a wooden ball), the large pavilion with a dance floor, and "swimming baths" back by the creek. An ancient oak was surrounded by a stairway and electric lights were strung overhead. The park name reverted to City Gardens after it was sold, and it was sold again in 1897 to the Grace Brothers of local brewery fame. Now it became a beer garden with a concession stand that sold ice cream and a roller-skating rink was added. As "Grace Park" it came closest to being Santa Rosa's own; Rose Carnival parades usually ended there, Burbank Day celebrations were held, and there were always big doings on Labor Day. There were concerts and children's carnivals and in 1905 there was a contest where men tried to catch a greased pig. Any illusions that it was a de facto public park ended in 1921 when Frank Grace sold the property. Nor had they maintained it as a town rightly should; the only original structures left were the pavilion and tree staircase. 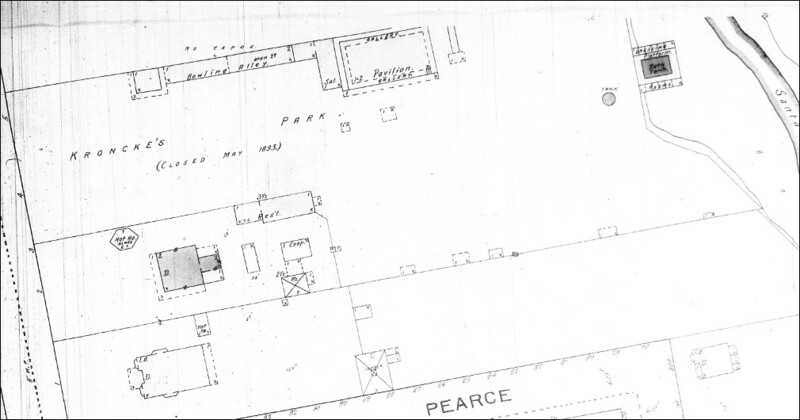 Even as far back as 1908 the fire map had noted the buildings were "old and dilapidated." Our story of the place ends with new owners Dr. Joseph Shaw and wife Frances, who started building their extravagant Xanadu-like mansion to house their art treasures. Construction of "Villa Francesca" was abandoned after his death in a 1925 auto accident, but the Shaws and their architectural dreams deserve their own item here, someday, As Luther Burbank's personal physician and closest friend, the couple's cremains are buried alongside Burbank. Santa Rosa's continuing - and painful - search for a park continued. 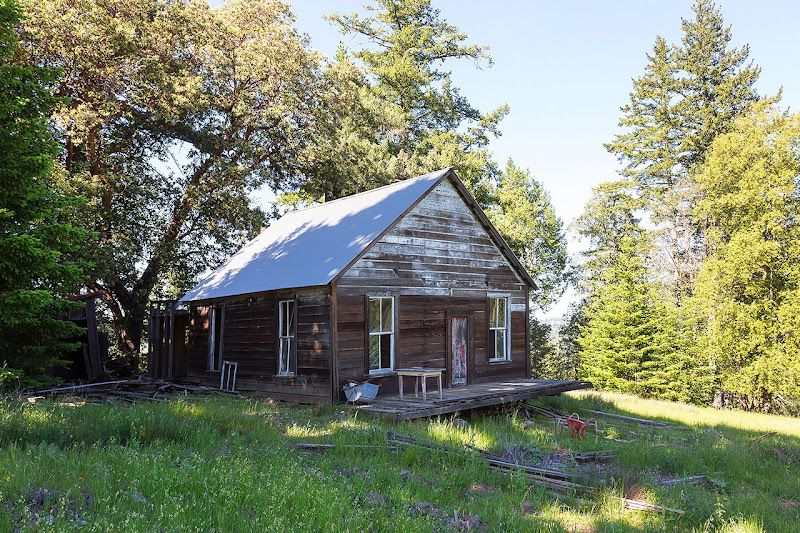 It wouldn't be until 1931 that Santa Rosa had a true public-owned space with the donation of the nine acre Juilliard homestead (although the first official park was created in 1922 when they set aside an unused spot out at the city’s reservoir). Before and after the Great Earthquake there had been various proposals to create a water park on the banks of Santa Rosa Creek, or buy the current location of the Santa Rosa Middle School, or buy the grounds of an old mansion on Mendocino avenue, or buy any of several undistinguished lots to the west or south of city limits. But it always ended the same ways: The town was too cheap, voters weren't interested or there was too much heavy lifting involved. For more on that history see: "NARY A PARK TO PLAY IN." Serious questions remain unanswered about the legacy of Kroncke's Park: Was it his Sunday excursions which set Santa Rosa skidding towards the ditch? We know by 1905 this was a "wide-open town," with thriving underground economy from illegal gambling and having the largest red light district between San Francisco and Reno. It's possible the park introduced a new form of gambling to Santa Rosa. Gambling was always sanctioned at the County Fair racetrack with the newspapers even printing the odds, while the rest of the year saloon keepers could be found to serve as hometown bookies for customers wanting to bet on out-of-town horse races and other events (see "THE MAYOR OF MAIN STREET"). But it's noteworthy that after Kroncke's grand opening with the ball and picnic, almost all of his excursion ads promoted some sort of sporting event. Besides sword fighting there was wrestling and sparring, baseball and football games and all kinds of athletic tournaments - just the sort of competitions which attract gamblers. I'll also argue Kroncke's excursions could have spurred prostitution here. The subsidized train tickets brought first-time visitors to Santa Rosa who learned it wasn't a bad daytrip - the ferry/train ride was only about three hours. Still, that was far enough away for scant risk of bumping into acquaintances from the Bay Area. But what is certain is the weekly surge of a thousand or so tourists brought in a lot of money - and downtown interests would have been loathe to jeopardize that. Taken together, it exactly fits the pattern of the corruption the muckrakers exposed here in 1905 - the courts and police willing to look the other way, government ignoring public outcry (it took 700-800 signatures, really?) and the newspapers spinning PR instead of calling for reforms. Such has often been the story of Santa Rosa, even today; we too easily find ourselves waylaid along the road of good intentions and forget where we were headed. Kroncke's Park gave us a place nice enough we wanted to ignore it also brought criminals to town. The reunited courthouse square gives us a place nice enough we can try to ignore its design and size makes it most look like a glorified helicopter landing pad. If you squint hard enough you can see anything you like, and Santa Rosa's pretty good at doing that. What a pleasant day it was! Churches all full, and pleasure resorts ditto. City Gardens thronged with several hundred people—listening to the splendid music of the brass baud, (36 pieces,) wandering through the lovely walks and saying sweet nothings while resting on the rustic seats, boating on the miniature lake, looking at the birds and animals, or watching gay youngsters going around the velocipede track at a 2-40 gait. A great many persons also crossed the Bay on Sunday last, and enjoyed themselves finely. The usual dress parade and guardmounting was had on Tuesday, and we noticed a marked increase in the crowd of citizens in attendance. After its close the sunset gun was fired, and supper discussed, and the non-commissioned officers and privates began to prepare for their enjoyment. The tents were placed in order with alacrity, and when the shades of evening begin to lower, the campfires were lit, the lanterns to shed their dubious light, and the camp took on its usual gala appearance. The splendid band took its position in the pavilion at the City Gardens, and soon the floor was filled with dancers. Drum Major Mayberry acted as master of ceremonies with ease, grace and dignity. All went off splendidly with the exception that the quarters were entirely inadequate to accomodate the crowd which thronged to participate. On Friday, P. H. Kronke purchased from Manville Doyle the eastern portion of the old Hewitt homestead on Fourth street, commencing at the old barn opposite the southern terminus of McDonald avenue, and will commence operations at once to lay it out for a public park. The tract fronts 130 feet on Fourth street, and is 700 feet in depth, so it covers an area of 91,000 square feet. He will erect an octagonal dancing platform sixty feet in diameter, remove the old barn and place a neat fence about it; and in every way beautify and adorn it. As it is near the intersection of Fourth street and College and McDonald avenues, its convenience will render it a very attractive place. H. Kronke is fitting his park up at the intersection of Fourth street and McDonald avenue, in a very tasty manner. He has just employed an English gardener, who will commence at once to lay the grounds out. There will be a large lawn, interspersed with flower beds here and there, and it will also have a fountain of running water in the center. Mr. Kronke expects to have the park opened to the public next season at which time he will give picnics and open-air concerts at short intervals during the summer season. 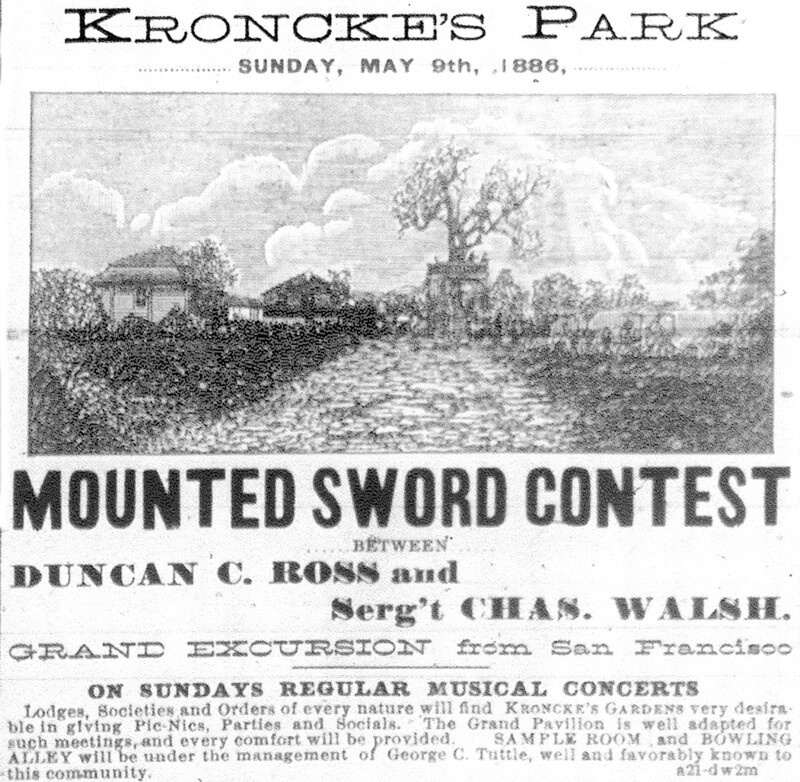 The sword contest between Duncan O. Ross and Sergeant Charles Walsh, at Kroncke's Gardens Sunday afternoon, attracted a large crowd of people from the surrounding country as well as from San Francisco, which place contributed fourteen coaches full of pleasure seekers. Tbe excursion train from San Rafael arrived about 2 p. m., and found street cars, ’buses and vehicles of all descriptions awaiting to convey the people to the grounds. The contest was one of the most exciting witnessed on this coast. Ross won the match by a score of fifteen to thirteen. At the close of the eighteenth attack the contestants availed themselves of an intermission, which interval was filled by Professor S. J. Reeves giving an exhibition of horsemanship on the back of a wild mustang, which seat he kept notwithstanding the saddle occupied the neck of the animal part of the time. With but few exceptions a good time was enjoyed by all. The exceptions were the loss of money through the agency of pickpockets, but that exception to the pleasures of the day is one that is attendant on all such occasions. Credit is due the enterprising traveling agent of the Donahue road, Mr. T. C. Wills, for his successful efforts in behalf of our little city. We understand that Mr. Wills, agent for the S. F. and N. P. R. R., has been in our city trying to make arrangements for Sunday excursions to agricultural Park. Now, we are willing to do any thing in the world we can to help build up our town and attract visitors, but it we are to be cursed with such crowds of roughs as some Sundays visit Sonoma valley, and that recently visited Santa Rosa, we trust the directors will refuse to allow the Park to be used for any such purpose. Just let a crowd of such hoodlums and roughs as we have mentioned have the free run of the Park for a few Sundays, and we will find hell located only half a mile from the center of our city. We think the Courier has a mistaken idea about the matter, so far as Santa Rosa is concerned, if by its allusion in the above, it has reference to any of the excursions from San Francisco that have visited Kroncke’s Park in this city. While it is a fact that two or three pickpockets plied their trade successfully in the crowd that attended the sword contest here, otherwise these excursions to this place have been very orderly and almost entirely free from the hoodlum element, considering the number of people present. Heretofore the class of excursionists that have visited our city and Kroncke’s Park have proven, with but one or two exceptions, to be as quiet and orderly while in our midst as could be desired. The excursion party Sunday, however, must have been made up of a different element. The depredations committed by some of the crowd have incensed our people, and they cry out against such excursion parties coming here, or if they are to come, to be kept from repeating their actions of last Sunday. A party of them, it is not known how many, broke into the Hungarian prune orchard of thirteen acres at the head of Third street, owned by H. and W, Pierce, and destroyed one or two trees and broke off at least fifty limbs, some large and some small, besides strewing the ground with several bushels of the half ripe fruit. Judge Hoag, in whose charge the orchard is entrusted, was away, and did not hear of the injury perpetrated by these hoodlums until Monday morning. It is also understood that a plum orchard suffered similarly, and, if anything, worse, for they did not leave a single plum on the trees. The excursion to this city and Kroncke’s Park Sunday, was made up chiefly of hoodlums, although there were many respectable people; and it is due them to say they took no part with the other and rougher portion of the crowd. It is well that the excursion Sunday is to be the last of the season, for our citizens have got enough of such visitors as have come here on one or two occasions of similar character this summer, and are about ready to organize a remonstrance committee. It should not be inferred that all the excursions have been objectionable; many of them have been composed of laboring men and their families, who came here to spend a quiet Sunday away from the noise and bustle of the great city. But the majority of the excursionists last Sunday were of a class contaminating in their mere presence. Their conduct while here was such as to keep our officers busy all the time preserving the peace. The women were equally as bad as the men, and incited their escorts to ribald actions. At 3 o’clock in the afternoon a general fight ensued at tbe gardens, and it was with much difficulty that the officers finally restored peace. One of the roughs was taken in custody and brought before Justice Brown, who fined him $7, and let him go. The Marshal arrested another "tough" on Fourth street soon after the arrival of the train, and experienced much trouble in getting him to jail. At the corner, by the Hall of Records, he showed fight, and had to be knocked senseless with a club before the balance of the distance was completed. Several personal fights ensued at the park during the afternoon, but no further arrests were made. When the train left for San Francisco in the evening about sixty of the hoodlums got left, and put in the night parading the streets. His Honor, Justice Brown, was seated on his bench bright and early Monday morning, in anticipation of a flourishing business after the excursion of Sunday. Jeremiah was also on hand, and after sweeping out the halls ot justice and tidying things up a bit, seated himself by the door to await the coming of the soreheads. The first one of the latter mentioned articles that Jeremiah had the pleasure of introducing to his Honor was one R. Taylor. His appearance was not in perfect keeping with his name; he looked as if he had not seen a tailor for some time. He informed his Honor that he had come up from San Francisco with the excursionists Sunday, and mistaking our City Marshal for an old friend trier to embrace him and was knocked down for so doing. The Judge thought that a man should pay for such a sentimental display, and charged him $10. He paid it, and Jeremiah bowed him out. The next was Thomas Jackson, who informed his Honor that he had merely engaged in a friendly tussle with an acquaintance at the Park Sunday, for $5 a side, and added that he thought he had been sufficiently punished in the whipping he accepted from his friendly antagonist. His Honor differed with him on that point, and, greatly to Jeremiah’s satisfaction, made the thing square for $6. The only occupant yet remaining in the prisoners’ dock was old Michael Fiahare, who was vigorously endeavoring to scrape a friendship with Jeremiah, greatly to that functionary’s disgust. At last his turn came, and after he once got started with his story of how he tried to bum a drink and was bounced by the barkeeper, there was no hope ot getting in a word edgeways. After a few ineffectual attempts at stopping the voluminous old bum, his honor gave it up and settled back in his easy chair. It was some time before the old man finished, and with tears in his eyes asked the Judge what he thought ought to be done to a barkeeper who treated his customers as he had been treated. His Honor was not much affected with the old man’s grief at the hard heartedness of the bar-tender, and in default of $30, Jeremiah was instructed to take Michael over to the County Jail for a period of thirty days. M. Byrne, proprietor of Byrne's Hotel, opposite the depot, was assaulted by an unknown party Sunday evening in the reading and bar-room of his hotel. Samuel Stoner, an eye-witness to the assault, related the following particulars to a Republican reporter who arrived on the spot shortly after the deed was done: "The assailant stepped behind the bar-counter, picked up the dinner bell and commenced to ring it. Mr. Byrne asked him to quit ringing the bell. The man still presisted in his annoyance when Mr. Byrne started toward him uttering an unpleasant epithet. The assaulting party then struck Mr. Byrne on the head with the bell and ran out saying he did not allow any one to abuse him. As soon as stuck Mr. Byrne fell senseless to the floor and those present ran to his rescue. The fleeing man made good his escape." It is thought he was an excursionist and left on the train which pulled out for San Francisco soon after the affair took place. The police officer searched the train in company with a witness to the scene but did not succeed in identifying the man. Deputy Sheriff L. Brietenbach and a witness boarded the 5 o'clock excursion train for the city with the hope of apprehending the assailant. Chief of Police Crowly, of San Francisco, was telephoned a description of the man. The offender is a young man with auburn hair and at the time deed was committed was in his shirt sleeves. A woman was instrumental in hiding him away. It is supposed he was intoxicated. Drs. Davis and Shearer were summoned immediately after the occurence and administered to the sufferer. Mr. Byrne, although unconscious for some time, is not necessarily injured fatally. He was struck in the back of the head. Depredations Committed by the Tough Element While in this City. Excursions like the one from San Francisco Sunday are unequivocally the reverse of desirable. There may be some cities in the State desirous of supplying their stock of Sunday amusements with importations of San Francisco hoodlum and tough, but Santa Rosa is willing to relinquish all claims to such pre-eminence. While there was undoubtedly a large number of respectable people among the excursionists, the major part was composed of the usual gang of San Francisco toughs, accompanied by their customary companions--first-class candidates for the Magdalen Asylum. The arrival of the train in this city was the signal for an unrestrained outbreak of that spirit which the tough is prevented from indulging freely at home on account of the vigilance of the metropolitan police force. This element, during their passage from the depot to the Park, took occasion to render themselves obnoxious to the respectable people with whom they came in contact. Ladies were insulted and a number of our citizens were crowded off the sidewalks. The conversation with which the sallow-faced individuals. dressed in chinchilla coats, entertained their vulgar female companions was an outrage on all sense of decency. During their stay it required the utmost vigilance of the officers to keep them within bounds. One of the toughs, who was arrested under the name of Tim Hallihan, entered Byrne's Hotel, Sunday afternoon, shortly before the departure of the train, and perpetrated an outrage which is likely to be revenged with the full penalty of the law. The tough walked behind the bar, announcing his attention of taking the establishment and commenced ringing the dinner bell violently, as if to demonstrate his ability and willingness to verify his words. Mr. Byrne's requested him to desist. His words had no other effect than to increase the volume of sound. He started towards the obstreperous individual as if to take the bell from his hands, whereupon he was felled to the floor unconscious, by a heavy blow under the left ear from the bell. The large crowd which had gathered immediately rushed to Mr. Byrne's assistance, which gave his assailant an opportunity to escape. He was not backward in improving it, and disappeared among the crowd which was just then swarming around the cars. A gentleman who had witnessed the occurence pointed the man out to Deputy Sheriff Breitenbach, who followed him on to the train. In the bustle and confusion the escaping tough concealed his identity and was not captured until the train was nearing Miller's Station. Trouble with the friends of the prisoner was anticipated, and the conductor of the train, Frank Grace, and two San Francisco policemen who were on the train came to the arresting officer's assistance. True to their loyalty, the toughs arose from their seats as if by one impulse and made a dash for the prisoner's liberation. No blows were exchanged. The toughs depended on their numerical strength, but were unsuccessful. The prisoner was brought to this city on the evening train and changes filed against him for assault with a deadly weapon. Justice Brown, before whom he was taken Monday morning, held him to bail at $500. It is understood that several of the saloons in this city were robbed in a bold manner. It is stated that while the train was at the depot in Petaluma a number of the excursionists weht into a saloon close at hand and robbed the proprietor of several bottles of liquor and boxes of cigars in a high-handed manner. From Mr. Henry Kroncke a Republican reporter learned that he was making extensive improvements in the park, preparatory for the coming season. This delightful place of resort became quiet famous last season, and as a result Mr. Kroncke states that every Sunday in April, May and June have already been engaged, and Mr. Kroncke's agent in San Francisco informs him that there will be no difficulty in securing picnics during the season up to August 1st. The park has been rented only to social clubs and societies, and Mr. Kroncke has exercised the greatest care in making contracts, as he can assure us that only the most respectable societies will be permitted to hold picnics at the park. The bowling alley will be fixed up again with several improvements. An outside bar will also be arranged for picnics. The swimming baths, will be in operation and conducted upon the same thorough and strict system as last year. These baths are one of the most attractive features of the park and arranged probably better than any of a similar character in the State. They are something that Santa Rosa has been in need of for some time, and the liberal patronage justifies Mr. Kroncke in continuing them. The work of improving the grounds has already commenced and the green grass, shady trees and blooming flowers will be a great attraction for Santa Rosans during the warm days and evening of summer. We have begun to look upon Kroncke's Park as an almost necessity; in fact it would be difficult to tell what we would do without it. The construction of the park and its success, has been one cause of Mr. Kroncke being placed in the lead of enterprising citizens of Santa Rosa. ...[I]t is the duty of this committee to ascertain the effect of establishing such a business in the locality described in the petition and ascertain whether or not it would be to the detriment of any other individual. We find no evidence that it would not, while we do find that within the last twelve months a protest of some seven or eight hundred names was filed with your clerk protesting against the licensing of a bar or drinking saloon in the premises described in the petition. Our own Superior Court has interpreted the spirit of article 2 of the ordinance to be the confinement of the liquor traffic to the central or business portion of the city, as a police regulation. If so, we should not ourselves break the law. The committee recommended that the petition be denied...The report was adopted by a unanimous vote of the council. The property former known as Kroncke's Park, now the City Gardens, was sold on Saturday to Grace Brothers, who will fit up the residence and the garden as a pleasure resort and park. The grounds are attractive and the location central. The property has been owned for some time by Joseph Kohnenberger, and the sale was consummated through the real estate agency of Davis & Farnham. It is expected that very extensive improvements will be made by the new owners.